On cold rainy days like these, my mother-in-law, (whom I prosaically call Aunty) would suggest a warming Mutton Curry for dinner. As a child, mutton was never on my wish list for special Sunday lunches. I found the meat chewy and stringy and never got accustomed to the strong flavor of an older sheep. 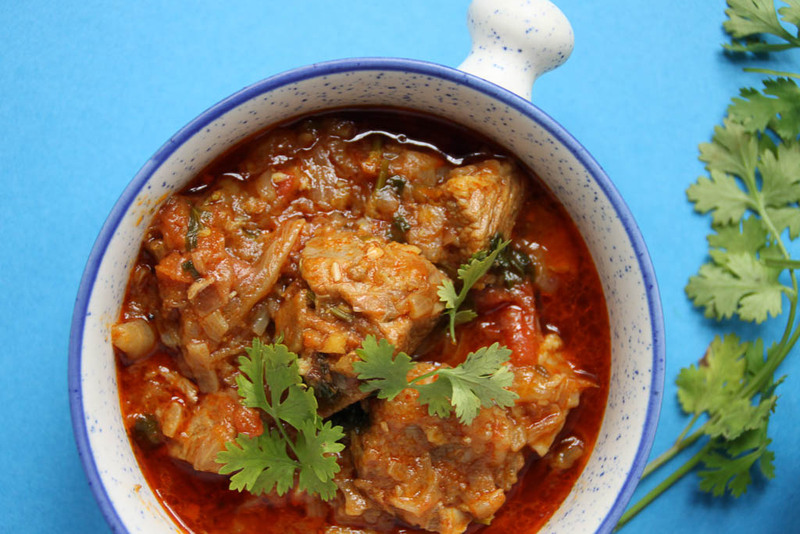 Whenever my mother made mutton at home, there would be a general consensus that I would not be partaking of any. 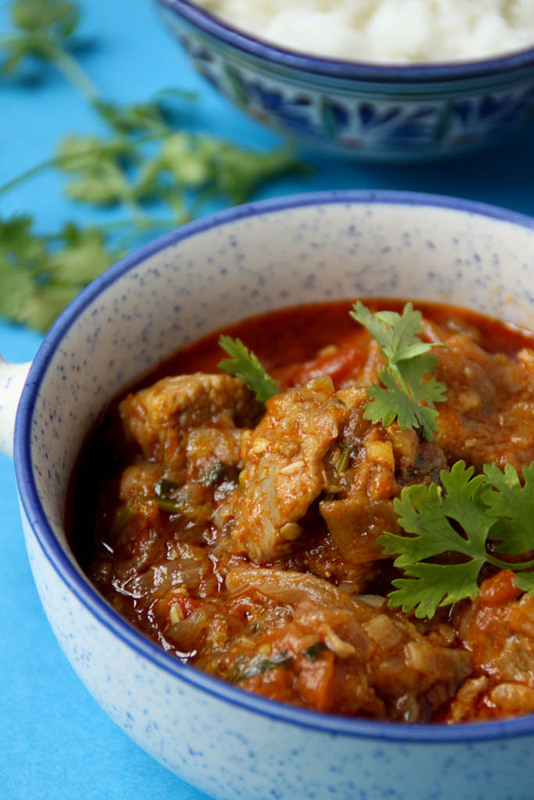 My mother herself never bothered to expand her repertoire of mutton dishes (save the Mutton Chops recipe and an occasionally Curry) because excluding herself and my grandmother, no one really cared for it. My vegetarian father was happy with his Buss Saaru (Greens and lentil curry) and I was happy with my chicken kabab and that was that. Though I dated my husband for five years before we officially tied the knot, I never really remember trying the Mutton Curry that Aunty made. Imagine my discomfort on arriving at my husband’s house and finding that the house favourite was Mutton in all its forms. The first couple of years I did what I always did – turned my nose up at it and ate the other Sunday main courses. The mutton always smelt delicious but how could I give up years of prejudice, just because something smells good? Fast forward ten years into my marriage – Mutton Curry is still the house favorite and now that equation miraculously includes me. I now unabashedly admit that Mutton is probably my favorite meat and the intense flavor that you get from Mutton is unmatched. My mother-in-law with her innumerable mutton delicacies also ensures that the ‘favorite’ title never slips from its place. 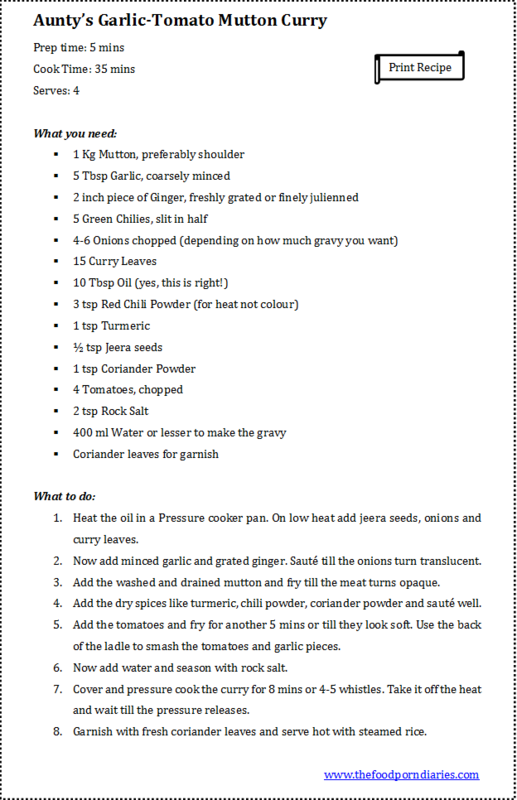 The Vellulli-Tamata Mamsam Iguru (Garlic-Tomato Mutton Curry) is probably one of the easiest recipes to recreate. Though my mother-in-law makes this often and in the earlier days I assumed it was a dish inspired from Andhra, recent conversations have revealed otherwise. My father-in-law was posted in Rajasthan for a year when he was in government service and the young bride that was my mother-in-law accompanied him as well. She reminisces that the year away from the extended joint family was one of her favorites. Being mistress of her own house and living an unfettered existence in the 1970’s was incredibly exciting to her. It gave her time to do as she pleased – whether it meant experimenting with foreign recipes, inviting a multitude of ladies over for chai or wrapping up her housework early in the day so that she could catch a matinee show. This recipe resulted out of a casual exchange over tea with one of her Punjabi neighbors. The original called for yoghurt, garam masala and loads of dry spices. I suspect my mother-in-law tweaked the recipe over the years to arrive at her current garlic inspired version. She prescribes this for everything from a cold to a raging fever or joint aches. I don’t know when the recipe assumed therapeutic properties, but even I agree that it is the best meal for a cold and rainy day like today.